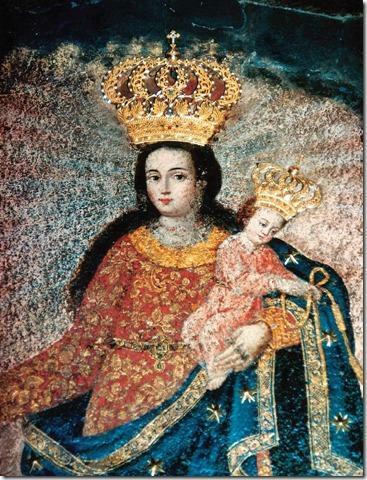 Recently (January 2013), Ms. Judith Navarrete of Los Angeles, a friend of Mary's Touch By Mail, made a pilgrimage to the Church-approved shrine of Our Lady of Las Lajas in Colombia where the first miracle occurred in 1754. Judy was overwhelmingly impressed by the supernatural nature of the images that she saw there and their significance for our current age when the decisive battle between Our Lady and Satan is being waged and is aproaching its dramatic conclusion. Judy saw in the cave surrounded by a beautiful basilica built in the 1950s the miraculous images of Our Lady with the Baby Jesus and also St. Dominic of Guzman receiving a rosary from Our Lady and St. Francis of Assisi receiving a cord from the Baby Jesus. The scientific examination of these images by the German geologists found that these images were not painted with any paint, dye, or other pigment but that the colors were the colors of the rock itself, which penetrated into the rock up to several feet. These images, so amazingly beautiful and stable with no changes for the past 260 years since 1754 can only be the products of the Divine Hands. In the 13th Century, Our Lord came to St. Dominic and St. Francis and asked them to save His Church from deterioration caused by the unfaithfulness and secularization of many of the clergy and people. Now, through the images on the wall in a cave in Las Lajas, God is asking each of all the members of the Church beginning with the Holy Father, to restore the health and vigor of His Church, promising the unfailing supernatural help from Himself through the Blessed Mother. The image of Our Lady in Las Lajas looks so closely identical to the image of Our Lady of Guadalupe. 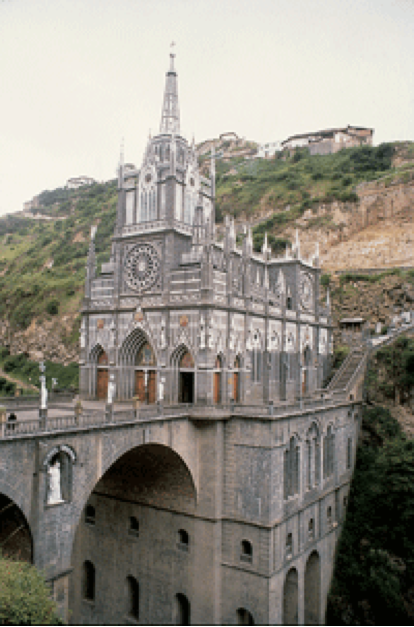 Las Lajas (which began in 1754) must be the continuation of Guadalupe (which had begun in 1531). Then, the Blessed Mother's efforts have continued through Paris (1830), LaSalette (1846), Lourdes (1858), Fatima (1917), and now Naju (which began in 1985). In Naju, Our Lord and the Blessed Mother performed the Eucharistic miracles 33 times and countless other miracles as the heavenly assurance that the messages through Julia Kim in Naju are authentic and said in Their messages that we are in the very age when the Triumph of the Immaculate Heart of the Blessed Mother will be accomplished overcoming the most violent and tenacious attacks and interferences by Satan and his forces. The Blessed Mother repeatedly asked us, "As I am the helper for Jesus, you should be the helpers for me." The merciful predilection of the Mother of God for Latin America is the reward she has given for the heroic faith formed from the Iberian Peninsula during the 800 years' struggle against the invading Moors and found in the Latin American peoples' souls in which Divine Providence willed to deposit it. In the year 1754, Maria Mueses de Qui–ones, an Indian woman from Colombia, was going from her hometown of Potosi to the village of Ipiales when she was caught in a great storm. 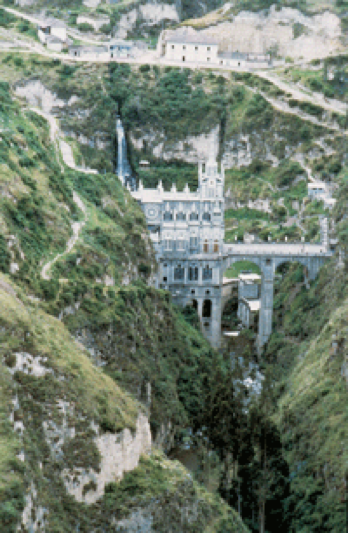 At a place called Las Lajas (the Rock Slabs), she sought refuge in a grotto. However, she was anxious since there was a popular legend that said the devil lived in the grotto. With trepidation, she entered the darkness of the grotto, invoking the Virgin of the Rosary. Suddenly, she felt someone tapping at her back, as though calling her. Frightened, she fled back into the storm. A few days later, returning by the same route, she once again reached the cliffs of Las Lajas, carrying on her back her little daughter Rosa, who was a deaf-mute since birth. Being tired and wanting to rest, Maria Mueses de Qui–ones sat down to rest timidly on a stone near the grotto. Then the first miracle occurred. Her deaf-mute child suddenly spoke, "Mommy, look at the mestiza who has detached herself from the rock with a little boy in her arms and two little mestizos at her side!" With this exclamation, Rosa slid off her mother's back to climb up the grotto's stones. Struck with terror, Maria took her daughter and fled from the mysterious place. There was general bewilderment among Maria's friends and acquaintances in Potosi when she told them what had happened. Thirsting for the supernatural, the Indians listened to her, asked her many questions, and commented among themselves about the singular event, but took no further action. In the meantime, Rosa disappeared, causing her mother great concern. Maria searched to no avail, until she remembered the episode at the grotto, and returned there to look for Rosa. She found her daughter kneeling before a splendid woman and playing affectionately with a child who had come down from his mother's arms. Knowing she beheld the Blessed Virgin Mary and her Son Jesus, Maria fell to her knees before this beautiful spectacle, and she was no longer afraid. TThe image of Our Lady of Las Lajas with the Child Jesus was miraculously imprinted on the rock along with the images of Saint Dominic, left, and Saint Francis of Assisi, right. The steep mountainside did not stop Our Lady's devotees from erecting the intricate shrine of stone in her honor. Unexpectedly, Rosa sickened and died. Her grieving mother carried her body in her arms to the grotto in order to beg the Virgin for help. Reminding the Virgin of Rosa's solicitude in bringing her candles and flowers, she begged Our Lady to bring her back to life. In answer to her prayers, the Queen of Heaven and Earth performed the miracle of the child's resurrection. Maria told her employers in Ipiales about the extraordinary event. Moved by the news, they went with priests, distinguished persons and many local people to the apparition's site. It was then that all saw stamped on the rock face a magnificent image of the Blessed Virgin Mary, holding her Infant Son, with Saints Dominic and Francis kneeling at their feet. The Virgin extended a Rosary to Saint Dominic and the Infant a Franciscan cord to Saint Francis. An interesting aspect of the image is the presence of Saint Dominic de Guzman and Saint Francis of Assisi, the founders of the two orders that first evangelized Colombia and to whom Colombians have always had a special devotion. The image of Our Lady of Las Lajas, as that of Our Lady of Guadalupe, has spanned the centuries without losing its brilliance. In the case of Las Lajas, the Divine Painter used a fade-proof method. After German geologists bored core samples from several spots in the image, they determined there was no paint, no dye, or any other pigment on the surface of the rock; the colors are the colors of the rock itself, and they penetrate into the rock evenly for several feet! In the course of the two thousand years in which the Church has spread throughout the world, artists have frequently shaped Our Lady's physical aspect according to the type of women of their time and region. This has happened in paintings, sculpture, stained-glass windows, and other media. The most ancient statues of her attest to this fact. In the remote days of the Church, statues of Mary Most Holy depicted her with a Mediterranean physical aspect. As the Faith spread among the Nordic people, blond and blue-eyed representations of Our Lady appeared. The modeling of images according to the regional feminine physical aspect is agreeable to Our Lady. This is proved by the fact when she impresses her image on some object in order to perpetuate the memory of an apparition or when she appears to a seer who then later describes her to an artist who will interpret the seer's description into a painting or sculpture. In Mexico, for example, Our Lady of Guadalupe stamped her image with Mexican physiognomies on Juan Diego's serape, where she can be seen standing on the moon and obscuring the sun that is behind her. The Aztecs worshiped the sun and the moon as gods, and the sight of this powerful lady overcoming their gods was the catalyst in the Mexican Indians' conversion. 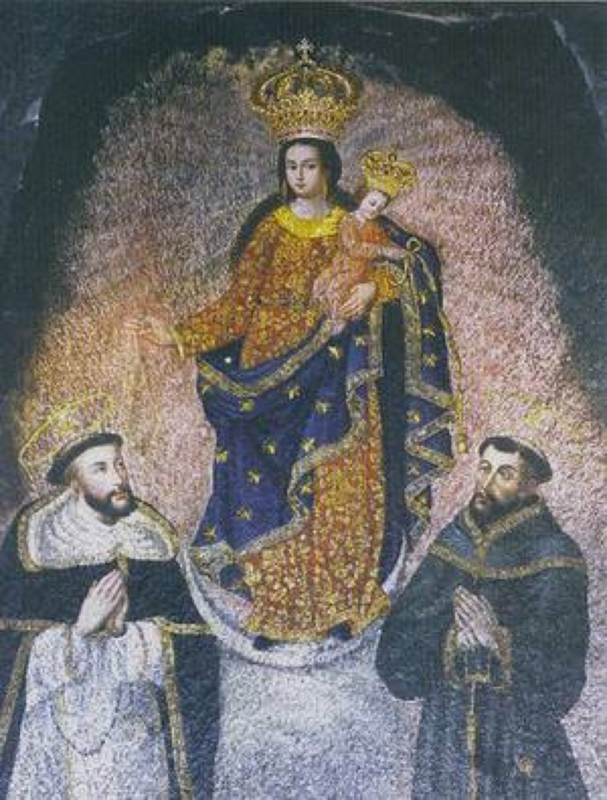 In Colombia, God performed the prodigy of printing Our Lady of Las Lajas on a rock. In view of these two very short examples, who can deny the deeply religious atmosphere characteristic of images painted by the Angels? As limited as one's sense of observation may be, one cannot fail to exclaim upon seeing her, "Look how Latin American she is!" Something very essential, a reflection of the qualities and virtues of the Latin American people, is expressed in Our Lady of Las Lajas. But what does her physical aspect tell us? We find a great personality, the profound and intelligent gaze of a meditating and recollected person. She has an extraordinary stability and solidity, a continuity of will and temperament. Nothing shakes or agitates her. There is no arrogance or ostentation, but rather the dominion of one who is accustomed to having her will obeyed. She could not have a better veil than her long, abundant, beautiful hair. The color and richness of her dress are those of a Queen. She is extremely kind and motherly. How good and safe the Child Jesus feels in her arms! What throne could be more worthy of Him? He is almost at play, with the liberty of a child. It is curious to note the relationship between Mother and Son. Frequently their images present them gazing at each other, but not in Las Lajas. They are so accustomed to being together that they have no need to look at each other in order to sustain their mutual attention. She directs her eyes toward the Latin American people, heeding their supplications, orienting and commanding them. Meanwhile, the Child Jesus enters the intimacy of those who arrive at the Queen's feetÑa Queen who displays in her gaze a kindness so exalted that she moves us to trust her entirely.